Home » Chicken Recipes » Buca di Beppo Chicken Marsala – this Italian classic dish is sure to be a family favorite soon. Buca di Beppo Chicken Marsala – this Italian classic dish is sure to be a family favorite soon. Make Buca di Beppo Chicken Marsala just like they do. This recipe was adapted from Buca di Beppo, in Lenexa, Kansas. This would go well with a salad, and cooked pasta. You can substitute another type of Marsala wine. I recommend the dry Marsala and not the sweet. Buca di Beppo Chicken Marsala is a delicious way to prepare chicken. Coat a large skillet lightly with olive oil and set over medium-high heat. Add bacon and cook just until crisp and lightly browned. Remove with a slotted spoon; set aside. Leave fat in the pan. Put flour on a plate. Pat cutlets dry. Season lightly with salt and pepper, then dredge in flour. Heat pan with bacon fat over medium-high heat. Add a touch more olive oil if necessary to make approximately 2 tablespoons. When fat is hot, shake excess flour off cutlets and place in pan. Sauté, turning once until browned on both sides. Thin cutlets should only take a few minutes per side. Remove cutlets. Pour excess fat from pan. With pan over medium-high heat, add the Marsala and scrape up the browned bits from the bottom of the pan. Cook Marsala until it is reduced by one quarter. Stir in cream and simmer until you get a nicely thickened sauce. Return the chicken and bacon to the pan and turn the cutlets to coat and reheat for a minute. Serve with the sauce over the top, with a sprinkling of parsley. Throughout the years I have tried several Marsala wines while trying to copy my own recipe (with mushrooms). My favorite wine is (also the cheapest) Cribari Marsala (CA). It has an ever-so-slightly more “raisiny” flavor than Bucca’s, but it has been the closest and best imo. It seems to be relatively easy to find as well in many states. I also use at least 1 cup of wine to 1 pound of chicken. Thank you for your specific suggestion. I have typically tried this with an inexpensive dry marsala. If like you said, “dry Buca di Beppo Marsala wine (not available to the public). Then what is adviseable to use in its place?? I would use another brand of dry Marsala wine. It will be close, but not exact. I hope this helps. What is in the red oil that is served with pizze at Buca di Beppo? I know this is a rather older post, however I will advice on this. The red oil is chili oil you can make it yourself by adding dry red chilies to some oil and either heating it slightly then letting it sit or let it sit till it turns red. There’s no cream or bacon in the Buca version of Chicken Marsala. Jeffrey is correct. Any fair table marsala wine has worked well in making this dish. Also, there’s something else on Buca’s recipe–either balsamic flavor or maple syrup, something very sweet other than marsala. The original is amazing! Being a former Kitchen Manager for Buca I was disappointed to see that this recipe is not an accurate represntation of Bucas Chicken Marsala. 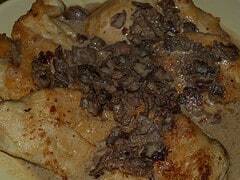 The Marsala wine is reduced by half prior to adding to chicken. 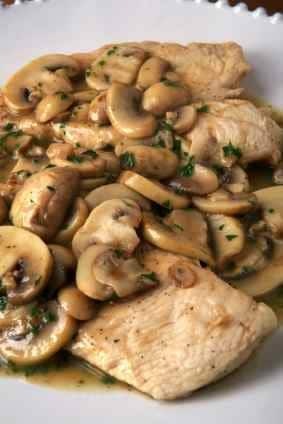 Once the chicken is sauteed with the quartered mushrooms it is deglazed with the reduced Marsala then reduced by half again in the pan with the chicken. It is finished with butter. Marsala sauce should have a med light body with a sweet flavor. Recipe does say REMOVE Chicken first, before deglazing! Loved this recipe. Very good and easy to make. Thanks for sharing this one.